First mix Flour, Salt, Black Pepper , Cornstarch, White Pepper, Baking Soda , Egg Whites, Beer in a bowl till it smoothens itself. 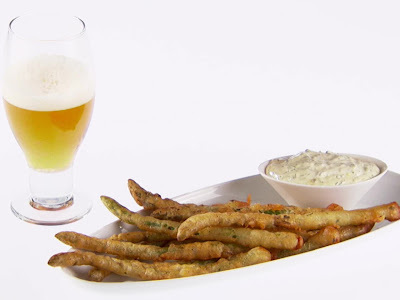 Dip the cleaned asparagus individually in mixed batter . Deep fry the dipped asparagus till it gets golden brown in color. Serve it hot with a cold one.